Sarah’s View from the Borderlands is Sarah Freeman-Woolpert’s new column for InDepthNH.org. Freeman-Woolpert is originally from Pembroke, New Hampshire. She graduated from The George Washington University in 2015 and is currently spending 10 months in Bosnia and Herzegovina conducting research on youth activism and civic engagement. 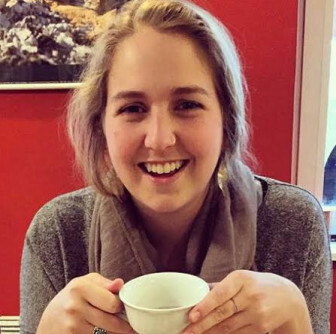 Celebrating our talented writers: Pembroke’s Sarah Freeman-Woolpert ponders her future in peace building and social justice while spending time in the Swedish forest. Sarah’s View from the Borderlands: It is a strange time to be representing America abroad with so much international spotlight on the presidential election and gun violence, topics I am asked about wherever I go. Sarah’s View from the Borderlands: Before leaving New Hampshire last August, I drove to the Concord City Hall to figure out how to submit my absentee ballot from Bosnia so I would be able to vote from abroad. Fat flakes of snow drift down from Sarajevo’s overcast sky as my bus rounds the hillside headed south. I have a one-way ticket to Mostar, the Herzegovinian city famous for its beauty and its iconic bridge, the Ottoman-era Stari Most. Sarah Freeman-Woolpert of Pembroke writes from the heart for InDepthNH.org while living in Sarajevo where she is conducting research on youth activism and civic engagement. “Do you ever work with the students from the other side of town?” she asked a friend there. Sarah’s View from the Borderlands is Sarah Freeman-Woolpert’s new biweekly column for InDepthNH.org. Originally from Pembroke, N.H., she is studying youth activism and civic engagement in Sarajevo. Last year, I celebrated Orthodox Christmas with a Bosnian Serb family in East Sarajevo. We climbed out of bed at six in the morning for a traditional and unbelievably heavy meal of roasted lamb that I could barely stomach at sunrise, half awake and half identifying as a vegetarian at the time.